This article is about Peach and Daisy's down special move. For other uses of the term, see Vegetable (disambiguation). Pulling a vegetable from the ground in Ultimate. Vegetable (野菜ひっこ抜き, Uproot Vegetables) is Peach and Daisy's down special move. When used on the ground, Peach or Daisy will pluck a large turnip. These turnips function similarly to items and can be thrown at opponents, dealing more damage and knockback if thrown at close range and less damage and knockback if thrown at long range. Occasionally, the turnips plucked will depict different faces, with rarer faces generally giving greater damage and knockback. The princesses also have a very low chance of pulling other items from the ground, including Beam Swords (not in Smash 4 or later games), Bob-ombs, and Mr. Saturns. Thrown Vegetables fall very slowly, and it is very easy to grab one after having been hit by one. As such, turnips will disappear in mid-air after a certain amount of time. This move cannot be used while Peach or Daisy are in the air. Vegetable has the potential to be Peach and Daisy’s strongest attack, with the rare "stitch face" turnip doing 36% damage (40% damage when smash thrown at close range) and having knockback strong enough to KO opponents at 72% in Melee and Ultimate and 130% in Brawl and Smash 4. This power is increased when considering the fact that a Vegetable that hits an opponent will bounce off, potentially allowing the princess to re-grab it in the air and throw it again. A glide tossed "stitch face" Vegetable combined with a down tilt or auto-canceled forward aerial has the potential to break shields. If the opponent's shield is broken, Peach or Daisy can set up a fully-charged sweetspotted up smash by throwing a turnip upward and charging her up smash or a fully charged forward smash at high percentage. The second rarest "dot-shaped eyes" Vegetable does 16% damage (22% damage when smash thrown at close range). Should Peach or Daisy pull a Bob-omb using this move, it can be her strongest attack in her entire moveset if the opponent is caught in the explosion, being a very dangerous and highly volatile projectile item. A smash-thrown Bob-omb will deal 25-38% damage in Melee and 25-36% damage in Brawl, with severe base knockback as well as very high knockback scaling in both games (making DI and momentum canceling ineffective for survival). In Brawl, a thrown Bob-omb can KO as early as 33%. As Peach usually has difficulty landing her fairly weak KO moves, the unpredictability of a Bob-omb pull can easily turn the tide of a match. However, Peach of course will receive damage and knockback herself if she is very close to the Bob-omb explosion. In Melee, the chance of pulling out one of the three items is 1/300, or an overall combined 1% chance of pulling out something other than a turnip. In Brawl, Vegetables have a shorter overall presence, disappearing when they hit the ground rather than going through it. They will also disappear upon hitting a shield or attack, rather than bouncing. If Peach is interrupted while plucking one from the ground, it will remain in the ground for a brief period, during which anyone can pluck it out. Size scaling is more refined in Brawl, so if Peach grows/shrinks while she is holding a Vegetable, they will also change in size with her. In this game, Peach has a 1/58 chance of pulling out a "stitch face" Vegetable, and a combined 1/128 chance of pulling out either a Beam Sword, Bob-omb, Mr. Saturn. The probabilities of each of the three items are no longer equal as they were in Melee, making Mr. Saturns overall more likely and Bob-ombs and Beam Swords less likely. In Super Smash Bros. 4, the move's sound effect was changed to the original sound effect heard in Super Mario Bros. 2. Peach can no longer pull out Beam Swords. The probability of pulling out rarer turnips and items appears to have increased, but exact numbers are currently undocumented. According to the tips section in the game, Peach has a 1/166 chance of pulling a Mr. Saturn, and a 1/250 chance of pulling a Bob-omb. In Home-Run Contest, Peach now exclusively pulls out "dot-shaped eyes" Vegetables. Additionally, the move now has more startup lag, as Peach fidgets when pulling a turnip. 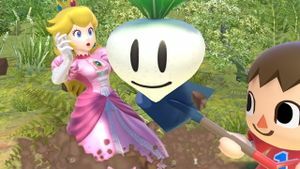 In Ultimate, turnips now bounce once they have hit the ground (though this is only aesthetic). Additionally, Daisy, who is Peach's Echo Fighter, retains Vegetable as her down special. The tips section states the same item probabilities as Smash 4—a 1/166 chance of pulling a Mr. Saturn, and a 1/250 chance of pulling a Bob-omb. "Pluck a veggie on the ground. The veggie's power depends on its mood." "Pluck a slow-flying veggie from the ground. Can only be used so many times in a row." "Pluck a heavy veggie that doesn't go far but can launch opponents." Light Veggie: Pulls out a slow-flying vegetable, but can only be used twice in a row. The vegetables fly back towards Peach when they hit an enemy, allowing her to catch them and throw them again. Heavy Veggie: Takes longer to pull out the vegetable and has shorter range; however, the vegetable deals much more damage and can launch opponents. Notably, a forward smash thrown "stitchface" at close range can break a full shield in one hit. Bob-omb and Mr. Saturn are unaffected by the custom move variants. If the player performs this move while running or walking off a ledge, Peach will pluck out a turnip without suffering any lag. This technique is known as a ledge-canceled turnip pull. A short-hopped turnip is also faster than a standing turnip in terms of startup frames. Turnips are also primarily used in conjunction with float-cancelled aerials, but turnips cannot be thrown while floating (though they can be dropped; see the Vidjocancel). When the player jumps with the intention of leading in with a turnip, they should follow a step-by-step process: jump, hold the button, throw the turnip, press down to float, and continue with any one of their aerials. Turnips are useful even while shielding, mainly because the player can shield cancel with a jump or turnip throw. If the player presses A with a turnip in hand and their shield up, the turnip will be thrown. This is generally only useful when someone has the player trapped in their shield and they cannot throw away their turnip and simply attack, or when the opponent is outside of grab range. However, an interesting tactic requires the player to shield, jump, and press Z (or simply hold jump) without any direction to item-drop the vegetable, a one-frame action. Depending on when Z is pressed, the turnip will either drop right in front of the player (if they hit Z immediately or just hold R) or right behind them (if they hesitate). The beauty lies in the fact that the drop basically lacks an animation, and the stun from the hit allows the player to follow up with a float-cancelled down aerial into basically any attack or grab. It is a nice variation on the simple shield grab; it can likewise result in some nice damage-building. Though this technique, just like item-dropping, can be used by any character with any item, the player can throw opponents' turnips while rolling. Using this maneuver, the player can actually throw a turnip (or whatever other item they may be holding) in the direction opposite the one which they are facing. To do this, they need to initiate the roll and either immediately hit A (or Smash Forward A for a Smash Throw) or delay it slightly to roll just barely before throwing said item. Hitting any jump button followed by Up A (or the C-stick) will make Peach throw the turnip upward. Also, smashing forward and hitting A will make Peach or Daisy throw the item with their dash-throw animation, which has much more lag. Once the player grabs a turnip, they must perform a short hop. At the peak of their jump (or just as they start to descend), the player must fast-fall and throw the turnip down at the same time (hold Down and Z together) and they will land on the ground, begin their throw animation, but keep the turnip in hand. This is a tactic that is useful for moving away while pulling a turnip, which is useful for obvious reasons. There are two ways to do it. The first is to dash towards the ledge, and the moment before you start to fall off, pull a turnip. The limited amount of slide Peach has should tip her over the edge while in her turnip pulling animation. This works with any platform. The other is done while floating, and then while floating backwards, landing on the edge of a platform or stage while facing away from it, and pulling a turnip. The limited sliding from the landing should tip the player over and continue their pull animation. This does not work if they face the ledge, because generally when they land from the float when facing the ledge, they will simply be stopped by the "falling over" animation. Knitting is a technique used to pull more powerful turnips in a more efficient manner. Damaging a character holding a turnip on frame 1 of an attack that hides held items on frame 1 (such as Peach's Parasol) will result in the turnip (or any item) being frozen in place after being thrown, acting as a stationary hitbox. It can be recaught and moved around the stage by any character. These vegetables, which first appeared in Super Mario Bros. 2, can be plucked from the ground and hurled at enemies. Unlike regular veggies, they often sport eyes or even faces; in fact, when Princess Peach plucks them from the ground to use as projectiles, the expressions on their faces dictate how much damage they'll do. Artwork of Peach pulling a vegetable out of the ground in Super Mario Bros. 2. Vegetables were some of the main weapons in Super Mario Bros. 2, the others being various items and the enemies themselves. All four playable characters (Mario, Luigi, Toad, and Peach) were able to pluck vegetables and other items, such as Bob-ombs and Red Shells, from the grass and throw them. There were two kinds of vegetables in Super Mario Bros. 2, unripe (smaller) and ripe (larger), and they came in a variety of veggies and faces, like turnips, peppers, and onions; however, only ripe turnips (with various faces) appear in the Super Smash Bros. series. Vegetables (turnips only) and other pluckable items have returned in few other Mario games since, like Super Mario Advance 4: Super Mario Bros. 3 and Captain Toad: Treasure Tracker. In the latter game, those items were instead plucked from Pluck Patches, which work the same way as the grass tufts did. Sprites of vegetables from the Super Mario All-Stars version of Super Mario Bros. 2. Peach throwing a vegetable in Melee. Peach with the rare "stitch face" vegetable in Brawl. Peach, pulling a normal vegetable from the ground in Brawl. The eight possible vegetables in Brawl, with frequency ratios and comparative damages. A complete table of all possibilities when using Vegetable in Brawl, including items. Peach pulling a vegetable from out of the ground in Super Smash Bros. for Nintendo 3DS. Peach, pulling a vegetable from the ground in for Wii U. Peach using Vegetable as shown by a Skill Preview in Ultimate. Daisy using Vegetable as shown by a Skill Preview in Ultimate. In Melee, Vegetables are one of the primary steps in activating the Black hole glitch. In Melee, even if Peach plucks an item during a match, she will still be awarded with the "Item-less" bonus and can additionally still be awarded with the item-related bonuses, such as "Beam Swordsman" and the Mr. Saturn-related bonuses. In Brawl, if one plucks out a Beam Sword while using this move, the sword's range will be severely decreased, as Peach will use her turnip throwing animation to swing the sword rather than her proper item swinging animation. After about a minute of wielding it, the "picking up an item" sound will be heard and Peach will be able to use it normally. This effect can also be canceled by dropping the sword and picking it up again, as well as taunting or using Toad. Early versions of Super Smash Bros. for Nintendo 3DS had a glitch where using this move at the start of an online For Glory match would result in a cheating violation for hacking in items. This glitch was fixed in version 1.0.2. Peach can still pluck items even during the Master (and/or Crazy) Hand fight. However, other characters with item-granting custom equipment can't use them during that fight. Vegetables plucked by a Master Shadow version of Peach will not be colored black. Despite not being present in Super Mario Bros. 2, Daisy plucked vegetables, including turnips, in the Mario Party 7 minigame Bumper Crop, alongside all other playable characters. This, along with Isabelle's Lloid Trap, are the only special moves that cannot be used in midair. Hand Slap and Pokémon Change used to share this trait, before gaining midair properties in Super Smash Bros. 4 and Super Smash Bros. Ultimate, respectively. Prior to 3.0.0 in Ultimate, Daisy’s turnips dealt less knockback at higher percentages and with high powerered turnips, due to her using Peach’s old knockback forumlas. This was eventually rectified in a software update. This page was last edited on April 21, 2019, at 16:57.